Welcome to the (gasp) 200th edition of the Festival of Frugality! It is a milestone that calls for celebrations; hence all these fireworks. Actually, it’s the perfect time of year for a fireworks display. Diwali took place at the weekend; here in the UK, the biggest fireworks event of the year is also looming. 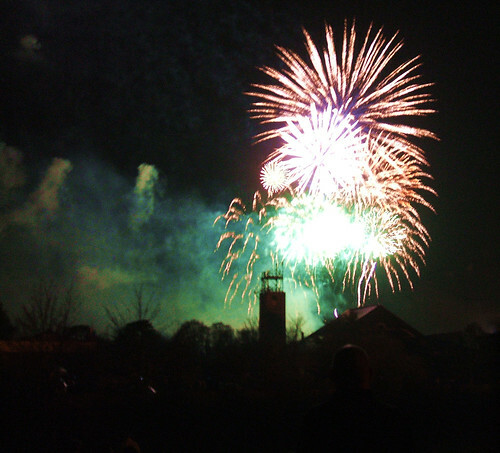 Fireworks Night – also known as Bonfire Night and Guy Fawkes Night – takes place on 5 November. Tyler presents Quit Worrying About 80% of Your Life posted at Frugally Green. He is looking at Pareto’s Principle, which will ring a bell with all those who have read the fantastical Four Hour Work Week book. A frugal blogger with a ken for Italian economists; what’s not to like? Wojciech Kulicki presents Navigating The 4 Stages of New Car Ownership posted at Fiscal Fizzle. A lot of thought has gone into this post – and some pertinent points have come out of it. Children make a Guy by stuffing some old clothes with newspapers, craft a head out of material, and either draw a face on it or buy a special cardboard Guy Fawkes mask. For a few days beforehand children are pushing guys around in prams, push chairs and go-carts, saying ‘A penny for the guy’. Adults then give them money – how much depends on how good the guy is. The guy isn’t just an effigy, of course; fashioned from rags and paper, he is also a monument to all things frugal and recyclable. The following posts stood out because of their shared, admirable commitment to the cause of Make Do And Mend. Kristia presents Nine paper products to cross off of your grocery list. posted at Family Balance Sheet. Some really good ideas here. Mama Squirrel presents Thrift and thanksgiving posted at Dewey’s Treehouse. She considers the fine line between thrift and cheapness. Rachel presents A Simple, Frugal Christmas Part III posted at Life Off the Shelf. Starting early this year, Rachel! FruGal presents Man alive, it’s nearly Christmas (keep it cheap) posted at FruGal. You too, FruGal? Nicki presents Nearly Impossible: Cheap & Healthy posted at Domestic Cents. This is a post about frugal food. The Happy Rock presents Frugal Family Traditions posted at The Happy Rock. This story revolves around a trip to a cherished park in autumn. Katie presents Kitchen Tip: Leftover Pumpkin System posted at Kitchen Stewardship. I really enjoy this blog. Viviana presents The Lean Singleton Eats posted at The Lean Times. The real Guy Fawkes belonged to a group of plotters who planned to polish off the Royal Family by blowing up the House of Lords during the State Opening of Parliament in 1605. The plot was leaked and the hapless Mr Fawkes was apprehended in a cellar below the House, guarding 36 barrels of gunpowder. He was executed for treason. Bonfires were lit around the country and songs were written, all to celebrate the King’s escape from assassination. The 1605 plotters were fiendishly cunning; the following bloggers demonstrate cunning of the clever, frugal variety. My kind of conspirators? The latter. Ray @ Financial Highway presents Probate- Why and How to Avoid Probate Fees posted at Financial Highway. This post does what it says on the tin. debt kid presents Following up on Zero-Based Budgeting posted at Debt Kid. This is an ambitious new cashflow management plan, which seems to be working well. Fabulously Broke presents Languages, prices and the ups and downs | Fabulously Broke in the City posted at Fabulously Broke ….in the City. Blogger FB has found that learning a new language can be free, if you find a way to use rewards and pull on your networks for help. 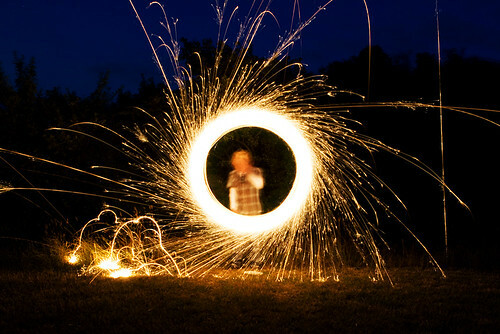 One of the biggest – and strangest – Guy Fawkes Night events takes place in the town of Lewes, East Sussex. It draws crowds of 80,000 and more. The town centre is closed and a torchlight procession takes place through the streets. The effigy of Guy Fawkes is burned alongside effigies of Pope Paul V (he was Pope in 1605; the plotters wished to restore Catholicism to the country at large) and topical personalities. 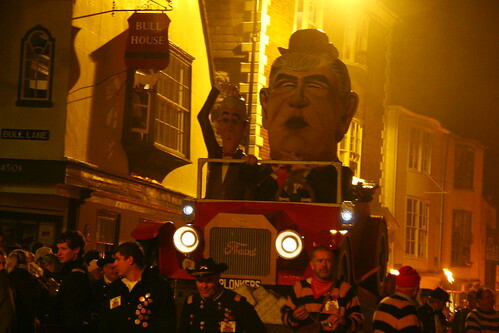 Here you can see our Prime Minister and Chancellor being marched to the bonfire; with the economy in a mess, they aren’t popular figures right now! Previous effigies have included George W. Bush and Osama Bin Laden. As you can imagine, this is a controversial event. No-one seems bothered about chucking Gordon Brown on the bonfire, but the historical head of a church – however much he may have been hated 400 years ago – is, erm, another matter entirely. The following posts were selected because they push the boundaries – the frugal boundaries, rather than the decency ones. Mike @ GLBL presents Money Saving Monday: the problem with mass transit posted at Gather Little by Little. I have included Mike in this category because he weighs up the costs of private transport and mass transit and concludes that sometimes, just sometimes, your gas-guzzling, environmentally unsound car comes out on top. Doctor S presents Frugal Vegas Vacation: No Hangover In Sight posted at Finance Your Life. Frugal and Vegas? Do those words really fit together? Good luck Doctor S! Baker presents Is Christianity the Only Path to ‘True’ Financial Peace? posted at Man Vs. Debt. In this video post, Baker – who has a lovely blog header, by the way – takes issue with one of the revered Dave Ramsay’s guiding principles. Kevin presents The Most Common Things People Steal posted at The Red Stapler Chronicles. His argument: that “the line between being extremely frugal and stealing is slowly being erased”. Yowzers. Peak Personal Finance presents Teach Your Child About Responsible Credit Use posted at Peak Personal Finance. Blogger Miranda recommends adding your teenager to your credit card as an “authorised user”; a decision that is sure to ruffle a few feathers. The barbecues come out on Fireworks Night. Foods traditionally eaten include jacket potatoes, wrapped up in aluminium foil and left to roast in the barbecue’s embers. (Traditionalists roast them in the bonfire.) These posts are the jacket potatoes: some staple ideas for a good, frugal lifestyle. KCLau presents What are Your Saving Habits? posted at KCLau’s Money Tips. Blogger Jacquelyn describes how the humble notebook can transform your spending and saving habits for the better. Hannah presents Feeding Babies Frugally: The Early Months | Cooking Manager posted at Cooking Manager. J.D. Roth presents Spend Less Than You Earn posted at Get Rich Slowly. J.D. says that this is his #1 piece of personal finance advice. Miss M presents Fight Fatigue: Make Meals Ahead posted at M is for Money. Tom @ Canadian Finance Blog presents 10 Money Management Tips For Expectant Parents posted at The Canadian Finance Blog. Manshu presents Prepaid debit card fees and facts posted at OneMint. Sparklers = happy kids (and happy big kids). These posts don’t just sparkle; they are little gems, filled with useful tips and quirky frugal ideas. Francine Jay presents My Top Ten Frugal Pleasures posted at FRUGILLIONAIRE. Like me, she finds that the simplest pleasures can go a long way. retirehappy presents Best Companies to Retire From posted at My Retirement Blog. Sadly, I fear that many of us will have to dream on! Patrick @ Military Money presents 2009 Veterans Day Discounts posted at Military Finance Network. Craig Ford presents 28 Tips for Organizing Your Finances posted at Money Help For Christians. DR presents Chase Slate with Blueprint Credit Card Review posted at The Dough Roller. PT presents 15 Surprising Places You Can Trim Your Budget posted at PT Money. Mrs. Accountability presents We Found Some New Toilet Paper «Out of Debt Again posted at Out of Debt Again. You go, girl! 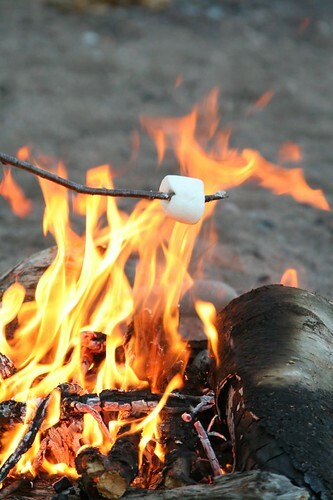 Ah, the humble, toasted marshmallow: it transcends national and cultural boundaries. Like marshmallows toasted over the bonfire, these posts are fun, moreish – and provide a sweet ending to any festival or fireworks night. The Financial Blogger presents Tips on Budgeting for a Wedding – Getting Married Without Going Broke posted at The Financial Blogger. Everyone loves a wedding! FMF presents Free Money Finance: Real-Life Money Saving Story posted at Free Money Finance. This one is about saving on car insurance. Super Saver presents Eat Out for Less – Off Peak Dinner Deals posted at My Wealth Builder. Bucksome presents Giving and Disney posted at Buck$ome Boomer’s Journey to Retirement. This post is about a new Disney promotion; definitely one with a happy ending! Image credits: dominic’s pics (fireworks); docklandsboy (Gordon Brown effigy); unsung (jacket potatoes); audiotribe; (sparkler); ninahale (marshmallow). Thanks for hosting and including my post in there!! Thanks for the editor’s pick! I really liked the theme!! Thank you for including my post about our new cheap industrial sized rolls of toilet paper, lol! Love the theme!! Who knew there was so much to learn about Guy Fawkes Day? Thanks for putting together the carnival and linking to my post. The lesson on Guy Fawkes day explanation is much appreciated by this Yankee. Thanks for hosting and including my article on Pareto’s Principle. Keep up the great work. Thanks for hosting! I’ll link. Thanks so much for including me. Great round up. Cheers. Thanks for hosting and selecting my post!!! Great job! Thanks so much! It was fun to be included! Thank you for the great carnival and trip across the pond. Thanks so much for including me in this wonderful festival; you did a brilliant job with the theme!